Should I buy fake security cameras or real ones? Do dummy cameras really work and deter crime? These are the questions many users ask in forums. If you also wonder if it is sensible to use fake security camera that look real, then this post is right for you. Fake security cameras are the ones designed to look like the real security cameras in appearance, but never have the features and functions of real ones. They are also called dummy cameras, simulated cameras, or decoy cameras. Now the fake cameras for security come in a wide range of shapes and sizes, such as the fake security cameras with red light and motion detectors. 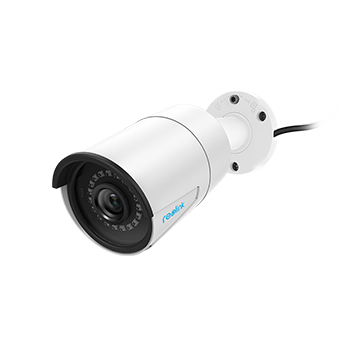 As the price of outdoor fake security cameras is much lower than the real ones, no wonder they are often built of inferior materials – many cheap security cameras even don’t have real lenses. Some of you may prefer fake outdoor security cameras to install outside your house, because you think they can fool intruders and stop home break-ins. Keep reading to learn why the fake security cameras for home won’t work. Here are top 10 reasons why you should not buy or use fake security cameras. Please note that fake security cameras, dummy security cameras, fake surveillance cameras, simulated security cameras, and decoy security cameras share the same meaning. Many of you prefer fake security cameras simply for saving cost. It seems to be widely accepted that fake indoor and outdoor security cameras are cheaper than real cameras. 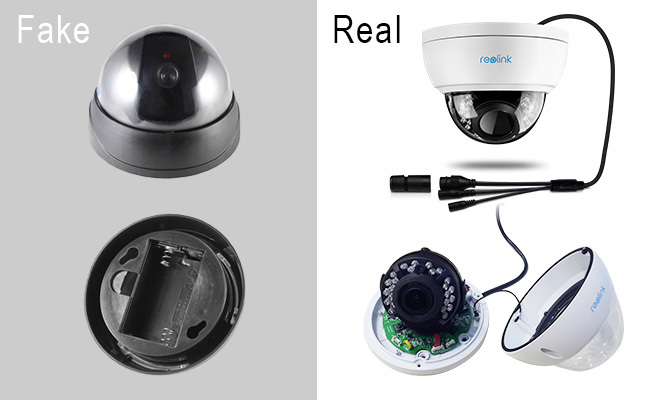 Actually, there are also many real and cheap security cameras combined with good quality and affordable price, such as the outdoor security camera Reolink RLC-410 at a decent price of below USD $65. Compared with the fake security camera for home, real surveillance cameras may also help reduce insurance premiums of your home and small business (read this guide to learn how). Moreover, you can also take advantage of the insider tips to save money when buying security cameras, like keeping tabs on the special offers and giveaways hosted by some top security camera brands. Below is a video shared by a user of Reolink RLC-410 (a lazy mailman threw a package from a distance). 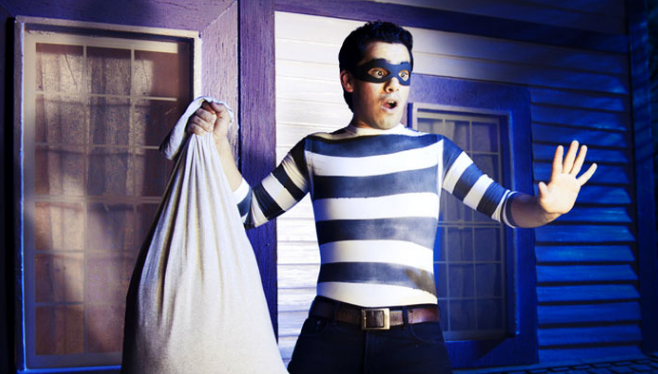 Burglars are much cleverer than you think. A knowledgeable or experienced criminal can easily tell the difference between a fake dummy security camera and a real one (like the 7 ways mentioned in this post). For example, almost all the fake cameras for security feature blinking light, the single-wire connection (missing wires) and the arbitrary movement of the lens. When a burglar knows you are installing outdoor fake dummy security cameras, your house must be the next target, seriously. A real surveillance camera can catch burglars or thieves “in the act”, which is exactly what a fake security camera fails to do. In the end, the fake video security cameras just descend to a useless decoration. Fake security cameras that look real also won’t help to record anything, even a theft is breaking into your yard and ready to invade into your house. This is too bad, especially when you are on vacation (see top 11 ways to protect your home while on vacation). A fake security camera will offer you nothing when you want to know who is in your house, if your children are back from school, whether the baby wakes up, what the dog is getting into, and whether your package arrives. One of the supper excellent features of real security cameras is that you can have remote access to your home and business from anywhere and anytime on your mobile devices. With nothing in mind, even the best fake security cameras offer you no peace of mind. What if someone breaks into your house? Fake security cameras can never inform you in case of any emergencies. You also don’t know what happens in your houses and when it happens with fake security cameras that look real. However, a real surveillance camera can tell you and show you all – taking Reolink Argus® 2 for example, it will send you push notifications, emails and audio alarm (siren) when it detects motions and finds dangers. Therefore, you can take responsible actions to deal with the events, like calling 911, to reduce your loss. It’s dangerous when someone takes undue advantage of fake security cameras for home. You can’t stop one or some of your neighbors leaking out the fake dummy camera information. When that happens, it can open up scope for crime in your area. Some unpleasant neighbors could use your outdoor fake security cameras to commit crimes for setting their personal scores. Fake security cameras that look real can also cause legal issues. No joking. Several home and business owners have been sued for using fake security cameras over the past years. They were said to have provided a “false sense of security”. Here is the case: An employee parks his cars and leaves his valuables intentionally within the company premises in the full view of a security camera. He returns to find that the car and the valuables have been stolen. When he asks to take a look at the video footage, his employer has nothing there because it’s an outdoor fake security camera. The employer has to battle a lawsuit. You may think you are clever to mix real and fake dummy security cameras together in your security system. When the fake security cameras that look real cameras are put together with the actual ones, they are more likely to be identified as the real “fake” ones. Unfortunately, when the crook commits a crime, the fake security cameras can never provide any proof. There is no face to identify, and no solid evidence to help the police catch the bad guy. As noted above, real security cameras are not necessarily more expensive than the fake security cameras in terms of price. Better yet, it can be quite easy to buy and to install real security cameras. You can purchase from retail stores, Amazon, eBay, Walmart, or some companies’ official websites. But, do remember to select a reliable brand and company that offers you sound after-sales service, like Reolink, who provides 30-day money back guarantee, 2-year limited warranty and 1-to-1 online support. So, instead of fake security cameras, what would be the best alternative to deter crime? The answer is obvious: real security cameras can go a long way to prevent thefts and burglary. According to the home burglary statistics, homes with security camera systems are up to 300% less likely to be broken into. Using fake security cameras, on the contrary, would only make your home or business the target of crimes, and put your family and property into the risk of being robbed. Besides the real security cameras, you may check out more effective burglary deterrents here. Do remember, though, your security should not be equal to or mean “fake”. Some people may persuade you to use fake security cameras for certain purposes (like they want you to buy their fake products), stay clear-minded and go for the real security cameras that work. This entry was posted in Buyer's Guide and tagged dummy cameras, fake security cameras, fake vs real cameras, home security. Hi, Brian, real security cameras can actually stop potential intruders, and this video serves as the best proof, /best-reolink-captures/?id=206502. As you can see, the thieves ran away immediately after they noticed the presence of security cameras.